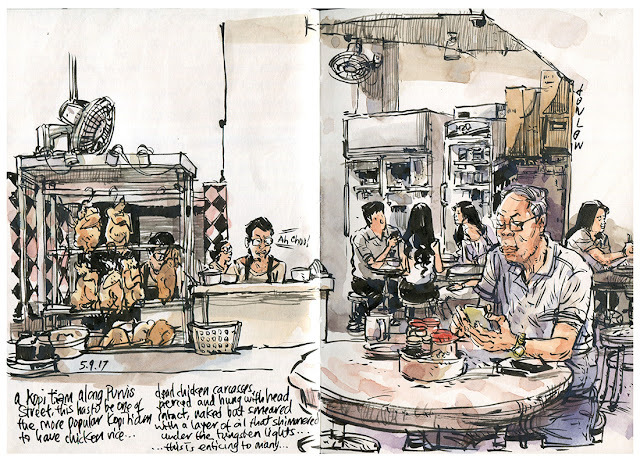 It is a kopitiam (with chicken rice stall) located along Purvis Street, just 5 minutes walk from the Bras Basah library and Bras Basah Complex. Most lunch goers come here for their chicken rice. You couldn't miss it because the chicken are all hung dripping wet with oil and glimmering in the lights near the entrance to the kopitiam. This is an irresistible delicacy for many Singaporeans.